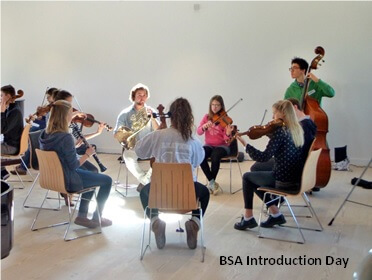 On Sunday 6 September 2015 a group of 30 young musicians got together for their first day of Britten Sinfonia Academy (BSA) 2015-16. With three quarters of the musicians new to the ensemble, we improvised, played games and rehearsed Beethoven’s Eighth Symphony. Over 10 months later the passionate and thriving ensemble, now all good friends, will be playing their last concert together of the year to include that same symphony. This group have worked hard all year, explored a variety of repertoire spanning a breadth of musical styles and grown and developed as an ensemble and as individual musicians. To celebrate an amazing year they will be performing their own At Lunch concert as part of Britten Sinfonia’s 2015-16 series – At Lunch Five in Norwich, on Thursday 30 June, and Cambridge, on Friday 1 July. Ahead of the upcoming concerts we want to take a little look back over the past year and celebrate the achievements of this delightful, talented and passionate group of young musicians by looking at some of our favourite moments. “It is so difficult to pick a highlight from the BSA year! All the time I have spent with the group has been really fun and it has been exciting to watch the group grow. One of my favourite things this year would have to be the concert at the Barbican where we played Vivaldi and Stravinsky – it was an exciting performance and the enthusiasm and commitment from everyone was so thrilling! 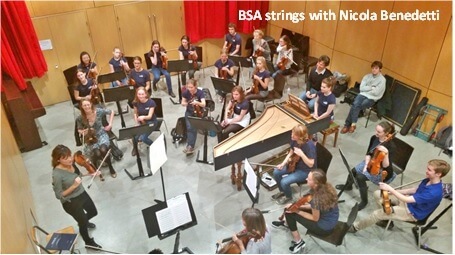 The young musicians of Britten Sinfonia Academy for 2015-16 have worked so hard all year – always with eagerness, fearlessness, determination and passion. We look forward to finishing the year with two amazing concerts and hope to see you there! Tickets are still available for At Lunch Five, featuring music by Philip Glass and Beethoven, and world premieres from Kenneth Hesketh and BSA member Jasper Eaglesfield, performed by Britten Sinfonia Academy. Hear it in Norwich St Andrew’s Hall on Thursday 30 June 1pm, and Cambridge West Road Concert Hall on Friday 1 July 1pm. Click here for more information and booking.